AdNews has been monitoring the parties’ ad spend across TV, radio and print, with Nielsen data showing the biggest spender is Clive Palmer’s United Australia Party. Since September 2018, Palmer’s party has spent more than $28 million. Both the Liberal and Labor Party have also been running targeted ads on social media. 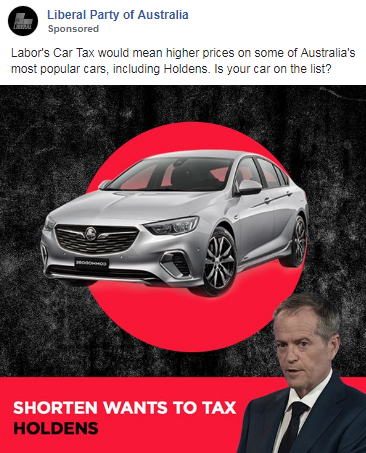 The Liberal Party was criticised for running ads on Facebook claiming ‘Shorten wants to tax your ute’ - despite there being no such tax by Labor. 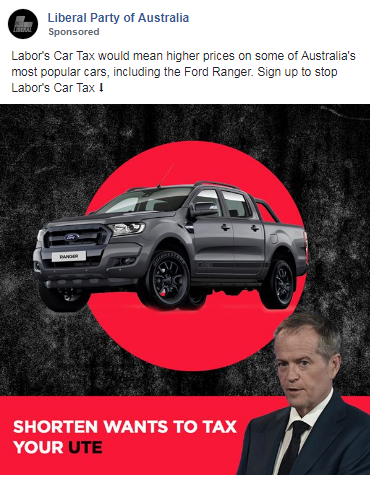 The ad come in different versions, with others claiming Shorten wants to tax your ‘Ford Ranger’ and ‘Holden’. The ads are in response to Labor’s plans to have 50% of all new car sales to be electric cars by 2030. The Liberal party has rolled out its first campaign ad as Prime Minister Scott Morrison announces the election date. The first work for the party centres heavily around Morrison’s family, with the Coalition leader narrating his plans for the nation. Now that the election has been called, for 18 May, the government enters caretaker mode which means the Coalition is restricted from using taxpayer money to air politically-charged ads. There’s expected to be an ad blitz from all parties over the next few days. Labor has already released its first ad for the campaign, along with a video taking aim at the government’s use of taxpayer money to run ads.